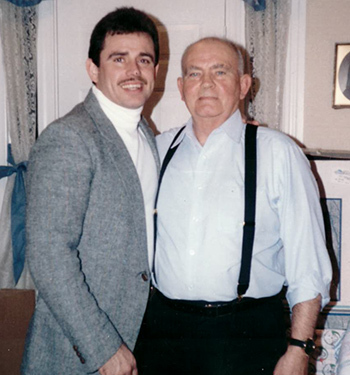 with his father Howard Verfaillie, Sr. The Victory story begins with the parents of CEO Bud Verfaillie. Although Verfaillie’s parents Howard and Dale did not have a formal education, they instilled valuable life lessons in their children as God-loving and God-fearing parents. His father Howard worked as a carpenter and clearly established and demonstrated their family’s set of core values on a daily basis. His father stressed the importance of serving God, working hard, caring for his family and helping others within his community in need. His mother Dale preached that anyone could achieve their life’s dreams with hard work and a tireless determination. Bud Verfaillie took his parents encouragement to heart, and went on to attend college. While in college, Verfaillie worked a full-time job and would become the first one in his family to attend and graduate college. Bud married his high school sweetheart Peggie, who also worked a full-time job while she attended and graduated college. In May, 1978, one week after college graduation, Bud created a sole proprietorship and started his own financial planning practice at the age of 22. Bud’s modest, yet fulfilling childhood provided a constant reminder and motivation that for many participants, his counsel may be the only financial advice they will ever receive. In honor and memory of his father’s teachings, Verfaillie operates his financial advisory firm with honesty, integrity, and professionalism. He is committed to providing client recommendations that serve in their best interest over profit. These core values are the cornerstone of Victory Fiduciary Consulting. In 1980, Bud created diversified investment models as a way to assure that everyone’s investment portfolio could be properly monitored, regardless of the account size. He wanted the smaller retiree’s accounts to be as well managed as the multi-million dollar accounts. Bud earned his Certified Financial Planning (CFP®) designation in 1987. He would go on to earn several additional professional industry designations. In 1995, Bud was concerned about potential conflicts of interest in commissioned based holdings. He created a comprehensive and objective mutual fund screening process which became the basis for determining the investment line-up of Investment Models. In addition, Bud created an extensive investment manager watch list program. Once his screening process was completed, Bud converted the entire investment line-up to non-commissioned funds, thereby converting the practice to a fee-based approach. In 1996, Bud shared this innovative investment screening system with other financial planning firms who were still offering commissioned based options. These financial planning firms were so impressed, that they began having Victory manage the assets for their individual clients. At the height of Victory’s advisory support program, they were serving the clients of over 50 different advisory firms, in over 15 states. In October, 2000, Victory employed 14 full-time and three part-time staff members, achieving the $100,000,000 mark for assets under management. In 2003, Bud determined the dynamics for long-term growth in the Advisor support program was changing, so he decided to withdraw from that sector and look for new business opportunities. Victory conducted extensive industry research from 2003-2005 and concluded there was a great opportunity in the 401k industry. Victory entered the 401k market place in 2005. In order to offer top level 401k consulting services, Bud earned two more compliance specialized professional designations, including an Accredited Investment Fiduciary Analyst (AIFA®), and Professional Plan Consultant (PPC™). and Victory Fiduciary President Ashley Rosser. 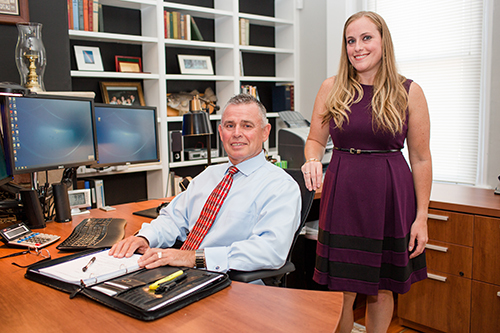 Bud achieved a long-term personal and business goal when one of his daughters joined his practice in 2009. Verfaillie’s daughter Ashley Rosser started out as an entry level apprentice, where she learned all aspects of the practice. Working as an understudy, she quickly learned all the necessary skills to provide outstanding financial counsel to both our 401k Plan Sponsors and our individual private investors. Ashley earned her Accredited Investment Fiduciary (AIF®) designation and was promoted to President in July 2016. Ashley serves as the direct liaison to Plan Trustees. “I have watched my father carefully lay down the foundation of our business over the past 35 years, with the cornerstones of honesty, integrity, and a strong work ethic. I am honored to have the opportunity to continue the legacy he started, allowing Victory to serve its’ clients for generations to come,” said Ashley Rosser. The financial industry is a heavily regulated profession that focuses on compliance. Due to the significance of fiduciary responsibilities associated with compliance adherence, we purposely enacted a name change of our firm from Victory Asset Management dba Victory Fiduciary Consulting to Victory Fiduciary to highlight the key role we play as fiduciary advisors to the clients we serve. In May of 2016, Victory earned the prestigious CEFEX (Center for Fiduciary Excellence) certification. CEFEX certifies that Victory Fiduciary Consulting implemented the industry’s Best Practices when servicing their clients. Today, our story is focused on two fronts. The first, is offering companies a 401k plan as good as the best run Fortune 500 plans. Secondly, we want to provide private investors with financial counsel that will provide them with a successful and prosperous retirement. We hope for continued blessings so that Bud Verfaillie’s grandchildren will have the opportunity to help their generation. We would love the opportunity to speak with you and hear your story.